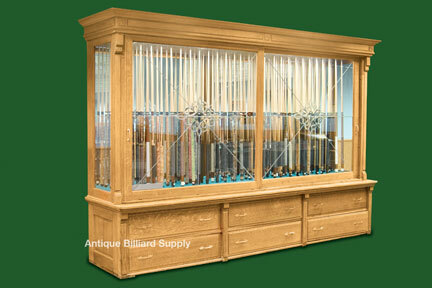 #7-19 Fabulous old display cabinet for a collection of antique pool cues. Quarter-sawn oak construction throughout. Sliding doors hand-built of beveled, leaded glass. Drawers in base section for spare parts and small artifacts. Holds more than 100 cues.